Like the sound of the cuckoo and daffodils coming into flower, the sight of the first asparagus spears poking bravely above ground is a sign that spring is on the way. Every year, I think they're leaving it later and later, but this time, these four spears just managed to get their heads above ground before the end of March, as usual. We ate the fella on the right (above) before we even left the plot, but experience suggests it will be a good two to three weeks before there's enough for a decent portion and after that we'll be struggling to keep up until June, when we'll stop cutting the spears and leave them to grow into fern. The plants need to rest and replenish themselves to store up nutrients for the next year's crop. 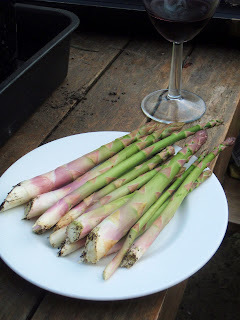 From last year, freshly cut asparagus spears. 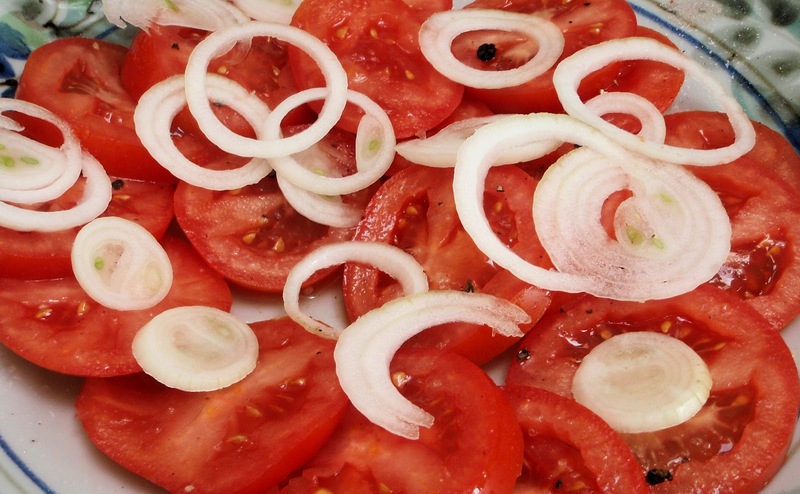 The subject of sweet onions was much discussed at December's Secret Garden Club session on the allium family. I've long been fascinated by these ever since a trip to the US where I encountered the strong cult following enjoyed by that named varieties such as Walla Walla Sweets. Walla Wallas hail from - oh yes - Walla Walla county in Washington State in the far northwest of the US. They look just like an ordinary yellow onion, but have been selectively cultivated since the beginning of the 20th century, when they were first brought to the US from Corsica, to maximise their sweetness. I've always wanted to try growing some Walla Walla Sweets - or failing that, Vidalias from Georgia, or the Hawaiian Maui onion - but seeds are understandably hard to come by in London. This year I managed to find some Walla Walla Sweet seeds from Nicky's Nursery in Kent. 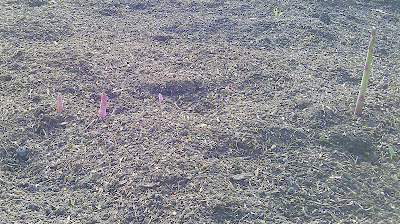 They need to be sown in March and kept at around 10 degrees C as they germinate. Nicky's advises trimming the tops to 10cm before planting out once the soil warms up and growing on as for any other onion. My Walla Wallas were sown on February 29th and are now germinating. So they are still very tiny and I'm still uncertain how they'll fare. In the meantime, I've been given a generous bagful of Oakley sweet onions by Pete Thompson of Brook Farm in Great Oakley in Essex. The Oakley onion is a strain of French onion from the Bourbonnais, and their delicate nature means that the mature bulbs are all harvested by hand. According to Pete, they are 'just a bit sweeter than a Cox apple'. They would make for a pretty overpowering apple, I reckon. But that sweetness means that the onions caramelises beautifully when cooked, in a tart or in onion marmalade, for example. 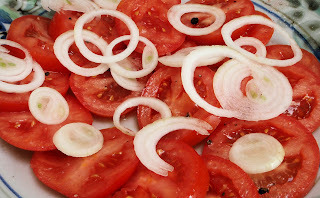 They also work well sliced finely into salads, where you get the onion bite without it being too heady, much like a spring onion, although I would say they are both sweeter and more pungent than a spring onion. I know very little about Nordic cuisine beyond what I've read in the news and about Noma, Denmark's number one restaurant. So for me, it's been about edible soil, cured salmon, foraging for berries and roots and wild herbs. 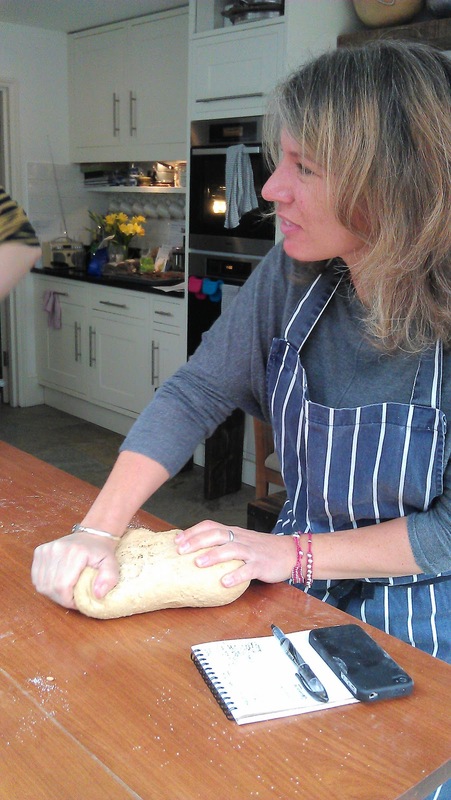 Recognising that this must be a rather skewed picture, I set off for New Nordic Cuisine For The Home Cook, a workshop run by the Culinary Anthropologist together with Mia Kristiansen of CPH Good Food in Copenhagen with an open mind, but not entirely sure what to expect. The next four hours were utterly inspirational. Food that was at once familiar - the climate and growing conditions in Denmark aren't that different to those in the UK - but used or combined in completely different ways. This is food that tastes clean and healthy, with lots of emphasis in contrasts in texture, and the use of souring agents gives many dishes an extra zingy flavour. Mia explained first of all that Scandinavian food refers, or should refer, to food produced in Norway, Denmark and Sweden only, while Nordic cuisine can refer to countries such as Iceland, the Faeroe Islands and Finland as well. She also explained that the parameters of the new Nordic cuisine demand that ingredients should be sourced from the Nordic countries, so items that we might regard as essential, such as olive oil, or lemon, were totally off-limits. Butter or pumpkin oil are used a lot, as are vinegars. Apple vinegar, for example, featured a lot during our morning. Dough for the beetroot crispbread, studded with pumpkin seeds. 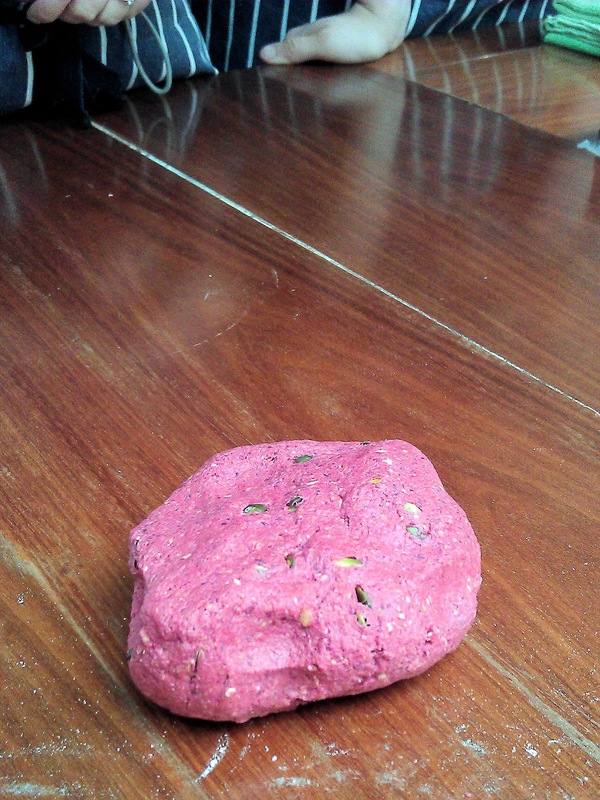 Made with spelt flour and rolled oats, the crunchy, wafer-thin home-made crispbreads were addictive - this beetroot version baked to a delicate rose colour in the oven. 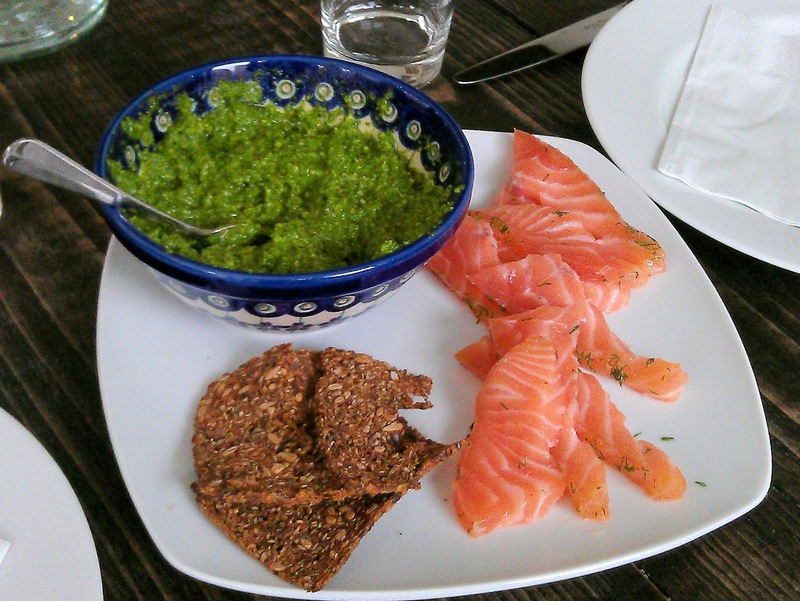 This light sweet cure with fresh dill is similar to gravadlax. The ramson pesto packs a lovely earthy green punch, made with wild garlic leaves, hazelnuts, rapeseed oil and hard cheese (I think we used Cheddar on the day). 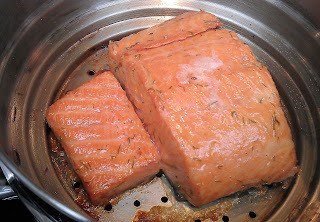 Salmon fillets, hot-smoked the way we do it at the Secret Garden Club! These were wonderfully tender and silky in texture. 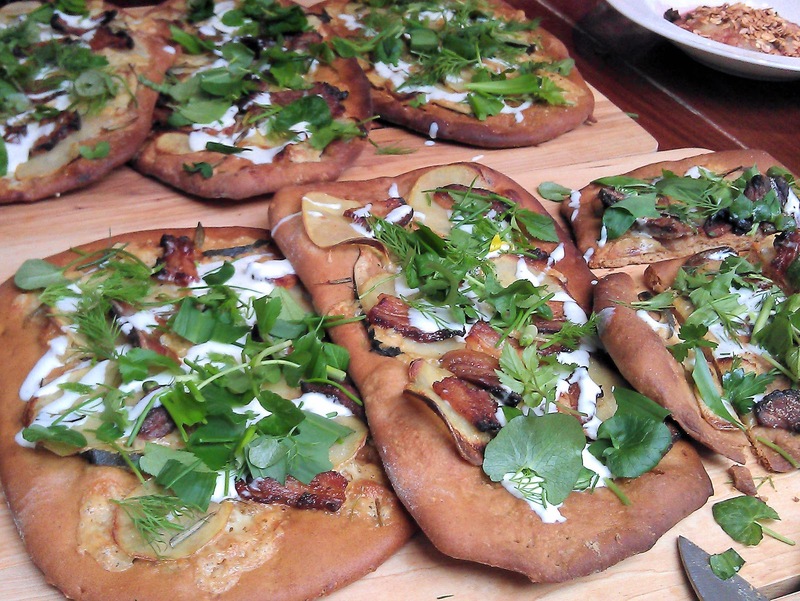 Malt pizzas with home-cured bacon and herbs. These were a revelation - nothing scary about the individual ingredients but combined in an unfamiliar way. The dough for the base has malt extract added to it - "Oh, I think it needs more malt," Mia would say every time she passed our station until she was finally happy with it. 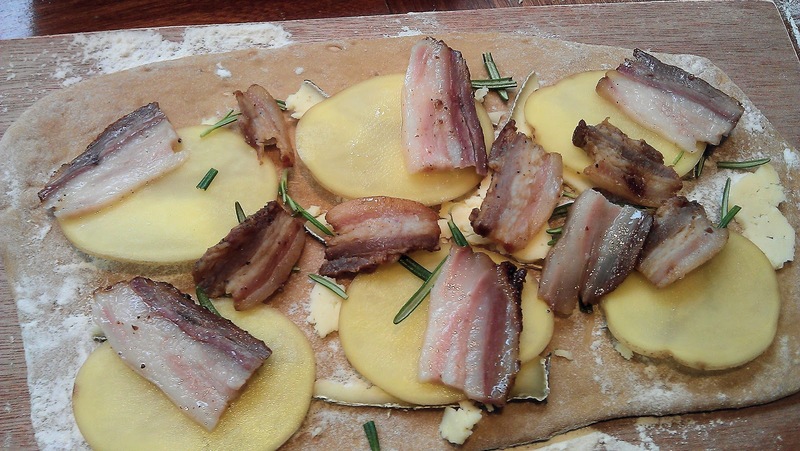 These baked beautifully crisp, and were topped with cheese (Cornish Yarg on the day), smoked pork belly, sliced potatoes, rosemary, herbs and a creamy dressing. 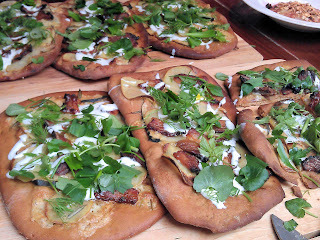 The result was recognisably pizza, but a wonderful melee of soft, smoky, malty, green and crunchy. I'll be making this back at home. Kneading the pizza dough. This one definitely needs more malt. Malt pizza toppings before baking. 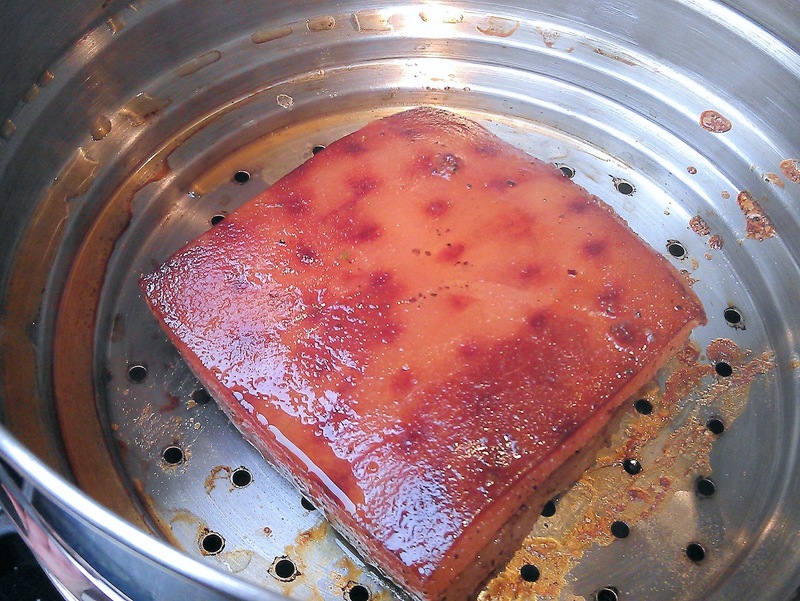 Pork belly piece, smoking in the double pan. A layer of smouldering wood chips sit in a foil pocket in the bottom pan under the steamer. 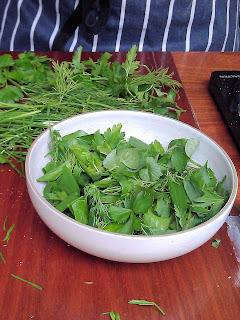 At this time of year I start to think longingly of the new season’s vegetables. We’re eating up the last of the winter roots and greens somewhat wearily now. The leeks are all finished as are the parsnips and cabbages – still a few maincrop potatoes in store and a never-ending supply of cavolo nero. This ‘hungry gap’ between the old year’s produce and the new makes me very thankful for the mixed salad leaves which are giving us some variety on our plates. 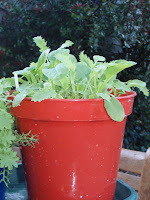 From oriental leaves like mizuna and mustard to lettuce seedlings picked as single leaves, a pot of mixed leaves on the windowsill will keep us going until the soil warms up and we can grow lettuces outside. Usually I throw together some leftover salad seeds from last year to make my own leaf mix, but back in January I was distracted by a 2 for 1 offer in a local garden centre and came home with a Speedy Mix and a Winter Blend from Thompson & Morgan to add to a packet of Marshall’s Salad Finest Mix lurking at the back of the seed box. 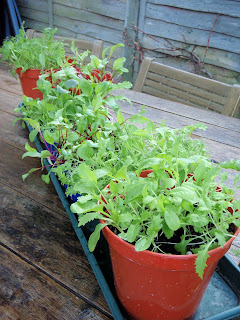 Each type was sown in a 6-inch pot on January 8th this year, using a mix of multipurpose and seed and cutting compost. 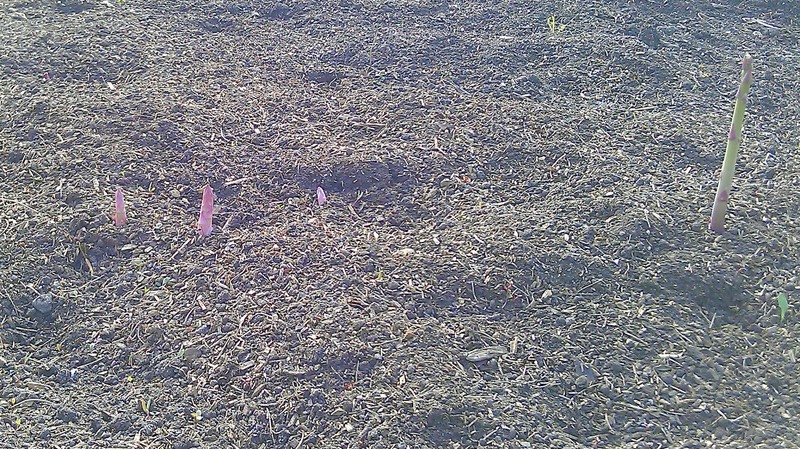 The seeds were sprinkled over the top of the compost and covered very very lightly with more seed and cutting compost. The pots were all placed in an unheated propagator and set under a north-facing skylight window to germinate. Each of the pots had seeds germinating after 5-7 days. 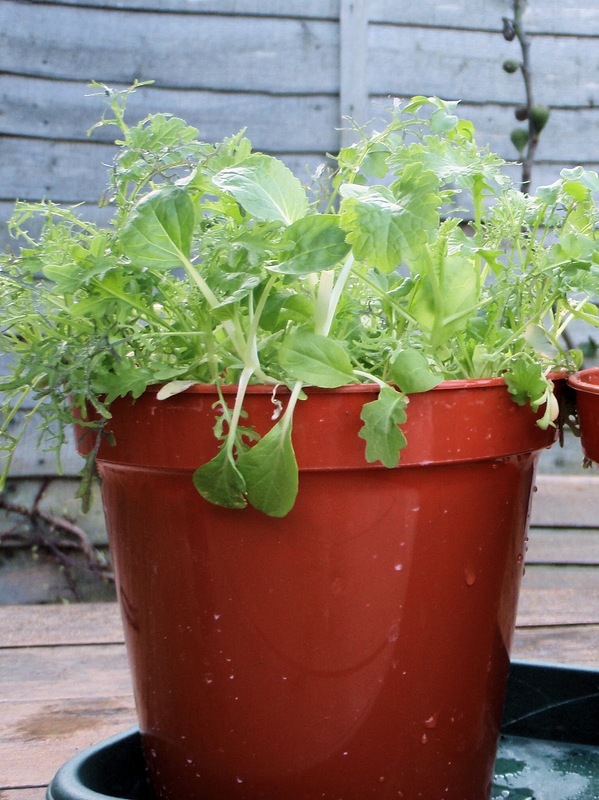 They were then taken out of the propagator and placed on a sunny south-facing windowsill, watered regularly and turned each day so that all the seedlings didn’t lean too much into the light. Six weeks later, and they are at that lovely tasty stage just past microleaf. Big enough to handle, but still beautifully tender and fresh-tasting. We’ve had a light salad of raw peas, feta cheese and the leaves and green salads dressed very simply with a smidgeon of balsamic vinegar. 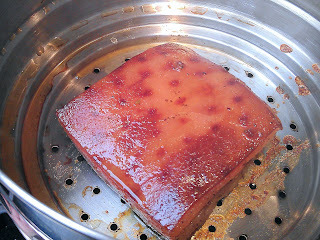 The leaves are still too delicate, I think, to be soaked in oil. 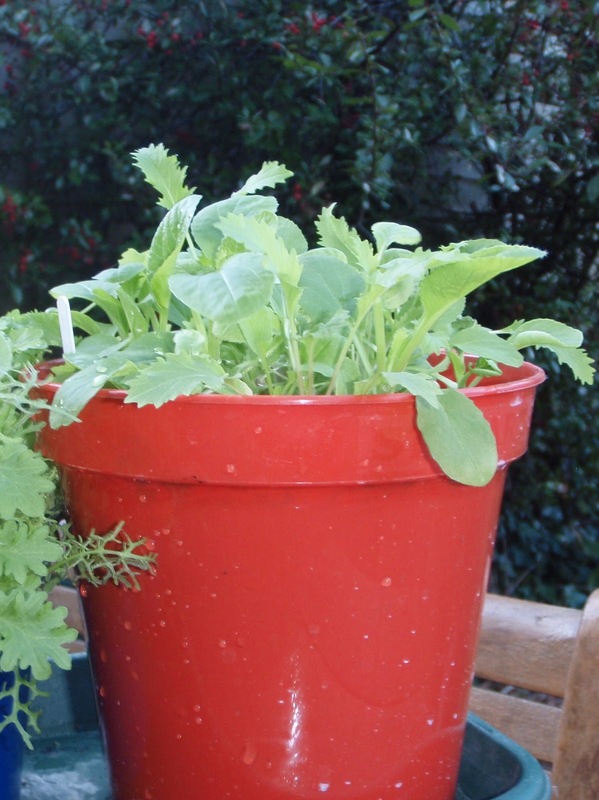 Winter Blend (left) contains Kale Scarlet and Blue Curled, Mustard Red Frills, Rocket Dentellata, and Mizuna. 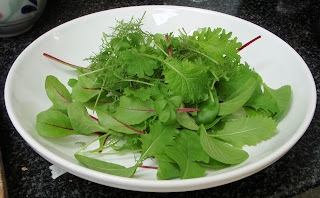 Speedy Mix (right) contains Salad Rocket Victoria, Greek Cress, Mizuna, Mustard Green & Red Frills, and Pak Choi Canton White and so is a bit of a cross-cultural mix with mainly oriental style leaves. 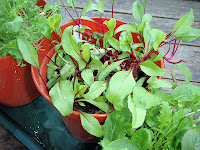 According to the packet Marshalls’ Finest Mix (centre) contains rocket, spinach, lamb's lettuce, red and green lettuce and leaf beet, but even on the closest inspection I can only find one or two spinach seedlings – everything else in my pot is leaf beet. Speedy Mix is heavy on the feathery leaves and the Winter Blend is more substantial, especially when some of the leaf beet from the Marshall Finest Mix is added. 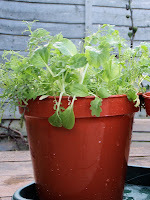 These cut and come again salad pots can be sown throughout the year although I do find that in high summer they are prone to bolting. Enjoyable though these salads are, I’ll probably never look quite so ecstatic while eating them as these women.